Blogger Amy Tiemann, who knew the kids from an after-school program discovered the Club and collected the constructions. She also interviewed the creators, and reported the results on CNET. A group of kids from one of our local elementary schools has formed a “mini-laptop club.” They don’t use electronic machines. Instead, these first-, second- and third-graders draw their own laptops on construction paper and pretend to e-mail each other. They dedicate a surprising amount of time to this activity. 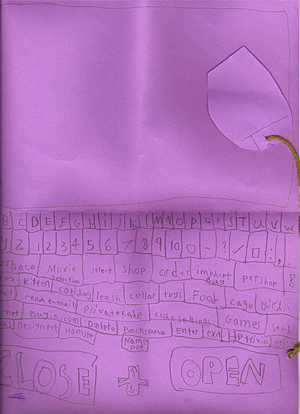 I once had a chance to examine one of their “keyboards.” I was fascinated to learn which Internet functions had sunk into the minds of these kids, who are just getting their first exposure to computers from watching their parents work, and from using kid-friendly sites. Knowing who your friends are, and either committing to a best friend or figuring out how to remain friends with everyone, are very important. That’s what fascinated me about their laptops. It was a way to demonstrate their knowledge of pop culture and social networks. Having your name on your friend’s keyboard is a little like being in someone’s “Top 8 friends” on MySpace. And yet these kids most likely don’t even know about MySpace yet. The inevitability of it all drew me to the paper laptops. Parents may want to delay their children’s computer use, but here they are drawing their own designs. It reminded me of taking away toy guns and seeing the kids make guns out of sticks instead.Kids are intensely social creatures and you can really see what is important to them by looking at their designs. I love all the keys dedicated to pets. Where my friends and I used to have imaginary horses, now these girls have imaginary pets with an online identity.